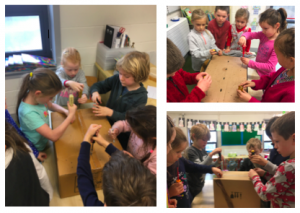 This month we have been exploring homes, construction of homes, and materials. Here you can see us practicing using screwdrivers and screws. We had a variety of screwdrivers and screw sizes and lengths. Can you name any of the the types of screwdrivers we might have used? One is named after the inventor, the other is named because of its shape. Through exploratory science we concurred that building a straw house was very unrealistic. 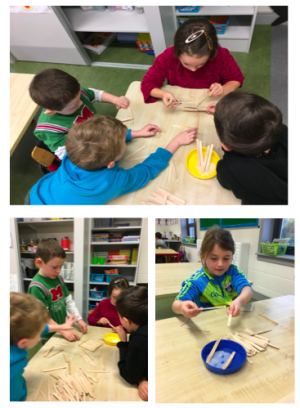 We also learned that although a wooden structure is quick and easy to make, it is not very sturdy. finally learned that using bricks/clay to make a roof was difficult as it was very heavy. 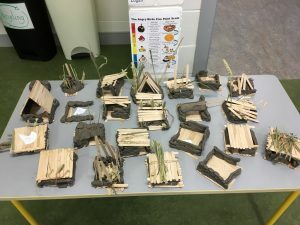 After discussion, we decided that using bricks/clay for the walls, wood for the roof and straw to fill the gaps in the roof would work best. This month we are learning all about homes. 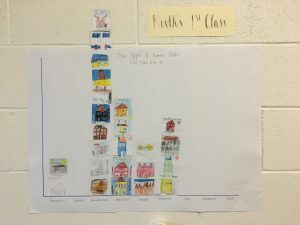 We decided to plot a pictograph to see the different types of homes Keith’s First Class live in. You can see from the picture below that the most common home is a semidetached house and the least common home was a bungalow. No one in our class lives in a caravan, a flat, a camper van or a tent. 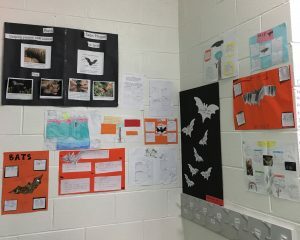 We were very impressed with everyones bat projects that they did at home. 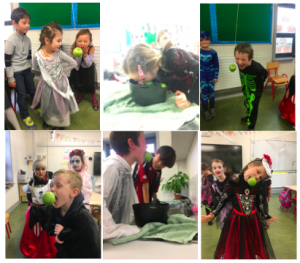 Each child presented their project to the class and discussed a bat’s habitat, diet, sleeping pattern and some fun facts that they learned while researching for their projects. 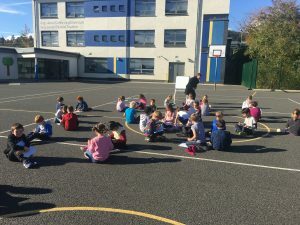 This month we went on a nature walk to identify some of the leaves of Irish trees. In particular we wanted to find leaves from an oak, ash, elm, sycamore and rowan tree. 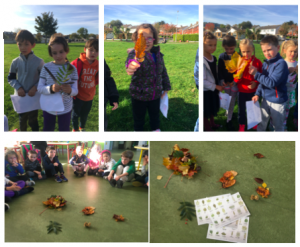 After learning about the leaves in class, we then used a legend to identify leaves out on our walk. 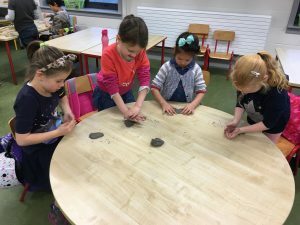 When we returned to the class we then separated our leaves into various piles according to type. We found some sycamore, oak, elm and ash leaves. Here you can see some of the party games we played on Halloween. We also had a disco in the hall with many other party games. Everyone designed a pumpkin face using 2D shapes. Teacher Keith then picked one at random from a hat and we carved this face onto our real pumpkin. You can see that “Pumpkie” (the name we voted for) has triangle eyes, a semicircle nose and a rectangle mouth. You can also see the picture that pumpkie was based on hanging above the real pumpkin. 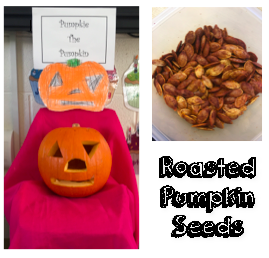 Teacher Keith then roasted the pumpkin seeds with some paprika and we had a taste test in class before lunch. Waste not, want not. 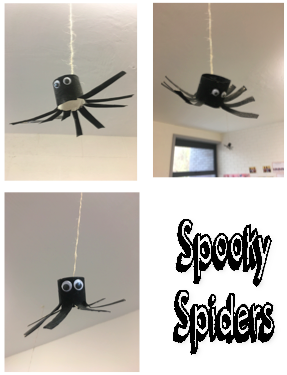 For halloween we made spooky spiders and hung them from the roof in the corridor. We used tissue holders that we cut into to make the legs and bodies. We then painted them black and stuck on some googley eyes. This week we made Halloween Pumpkins. 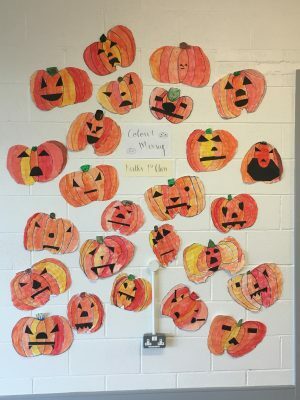 Firstly we planned our pumpkin faces on an A4 page. Then we made our pumpkins using paint. To make them more realistic, we used red, yellow and white to mix up different tones of orange. 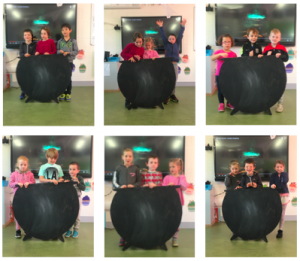 We painted each segment of our pumpkins a different tone to make the pumpkins appear more 3D. We then cut out 2D shapes for the face. 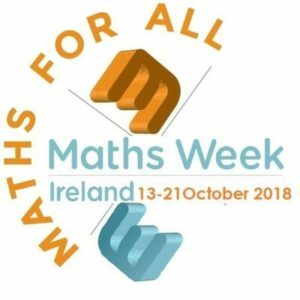 In honour of maths week 2018, below are some examples of what we have been learning this week in Maths. This week the aim is to make maths as fun and engaging as possible. 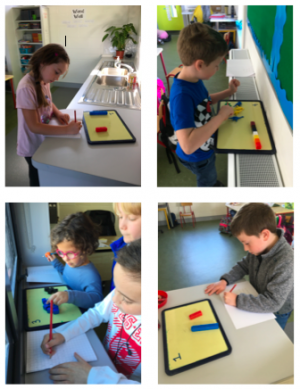 To prepare us for making our Maths Eyes posters at home, we made some Maths Eyes pictures using various resources such as pegs, buttons, straws and cubes. 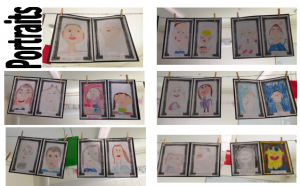 We made some pictures, wrote questions and answers, and then we looked at each others Maths Eyes pictures. Teacher Tracey has been teaching us all about pulse and rhythm. 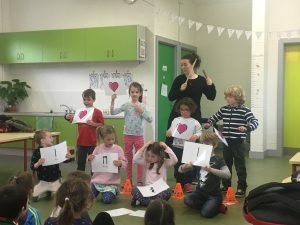 Here you can see one of our lessons where 4 children represent the pulse of the music, the other 4 children represent the rhythm. The rest of the class then sing the music using from the notations. You can also see Teacher Tracey keeping beat with her sticks so that we all sing together. Using inspiration from the signs of Autumn we wrote acrostic poems using our names. 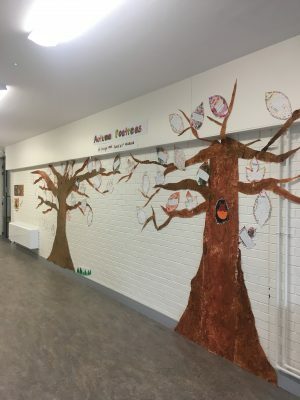 We then wrote them onto leaf shapes and painted them in Autumnal colours using a pointillism technique. We hope you are as excited as we are to watch the seasons change on our trees. 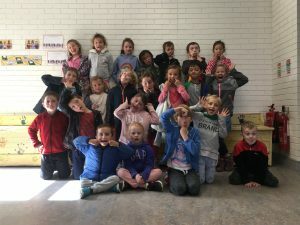 This week we were learning all about how to do a project. We were learning about hedgehogs. We found some interesting facts about their habitat, diet, sleeping patterns and some other fun facts. We then made group projects about hedgehogs. 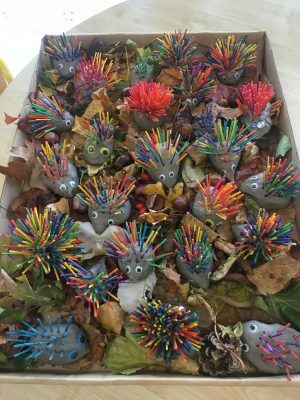 We also made these cute Autumn hedgehogs and used some leaves, seeds and conkers from our nature box to bring the scene to life. 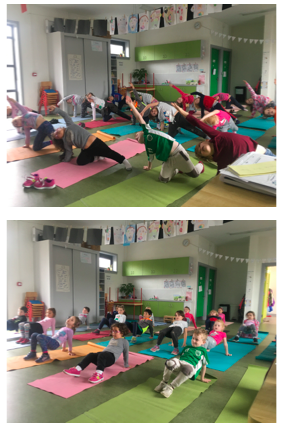 This week we made the most of the rain and did some Cosmic Kids yoga in the classroom. We pushed back the tables and brought some yoga mats down to the class. We each had our own mat to do the yoga. Here you can see our Extended Side Angle Pose, and our Crab Pose. 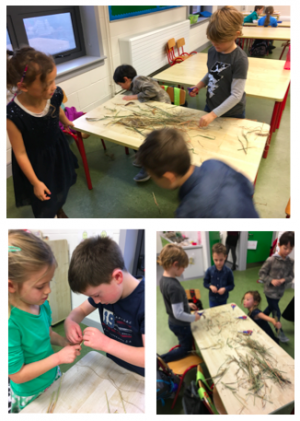 This week Teacher Jacqui gave us a flowering plant that was looking limp and lifeless. We decided as a class that it might have needed water. The following day we noticed that the flowers were standing up taller and the plant looked a lot healthier. This got us wondering how plants absorb water. In order to explore this further, we put a piece of celery in a jar with food colouring. After a few days we noticed that the tips of the leaves had turned red and there were red lines up the stalk of the celery. 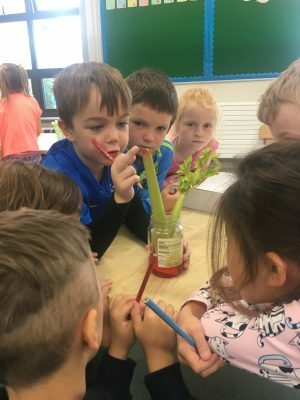 We concluded that the celery absorbed the water with the dye through the roots which coloured the leaves red. We couldn’t believe what we walked into this morning. 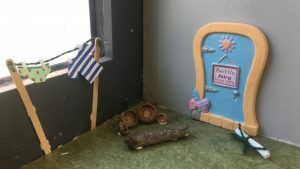 We have 4 fairies that have set up camp in our class. Síofra the main fairy, Donncha, Fia and Oisín. Fia told us that she is a tooth fairy, so if we lose a tooth in school and can’t find it, she will! It appears they are using acorn shells and twigs from our nature box as chairs. They also left us a letter introducing themselves and thanking us for letting them use our classroom for the year. Here are some photos from our maths stations. 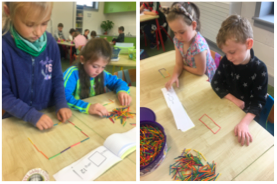 With Teacher Sinéad we used matchsticks to make 2D shapes with an assigned number eg. make a square using 12 matchsticks. 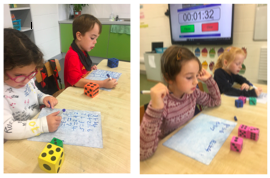 With Teacher Keith we rolled 3 dice, we then added two dice and subtracted one from the total. This taught us the importance of putting the bigger number first. We also had an independent station where we wrote addition, number sentences using two dice. In attempt to learn what a magic ‘e’ words was we decided to play a fun game of bingo using some magic ‘e’ words. 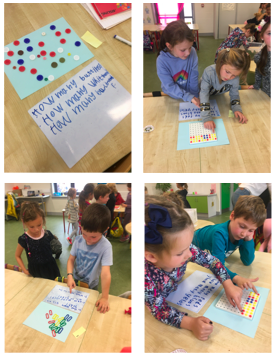 After brainstorming a list of words on the whiteboard as a whole class we then picked 9 words each to write on our mini whiteboards so that we could play the game. If we had a word that was called, we covered it with a cube. The first person with all their words covered shouted BINGO!!! Make sure to ask your child what a magic ‘e’ word is. Hint – Some examples of magic ‘e’ words are lake, race and face. Here you can see our “Walking Alphabet” this is a fun game using alphabet cards. 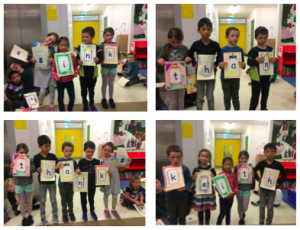 Each child was assigned a letter. The group were then given a word that they had to make. You can see the progression in difficulty in our words. ink became sink, which became think, which we turned into thank, which we then made into thanks, which then became… Keith? Ok, maybe that one was done for selfish reasons..! But regardless, this was a fun way to practice spelling some tricky words. This is our class dancing to one of our GoNoodle songs. We use GoNoodle for busy breaks when we need to get out of our seats and get our sillies out. The character we voted for was Om Petalhead who is now in stage two of her growth. 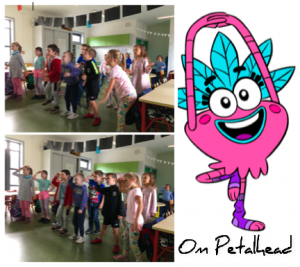 For every 10 GoNoodle dances we complete, Om Petalhead undergoes a development where she grows in strength and size. GoNoodle is great for concentration, coordination and gross motor development, but best of all, it’s so much fun!! 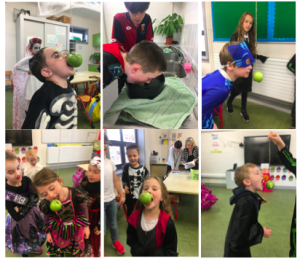 While reading George’s Marvellous Medicine and hearing of all the toxic ingredients he included in his medicine, we began discussing how we can identify different materials using our senses. We learned about our 5 senses and how we can use them to identify various materials. 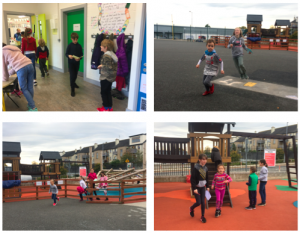 We then went on a sensory walk in the school garden to use our senses to explore the environment. We described things we could smell, touch, hear and see. 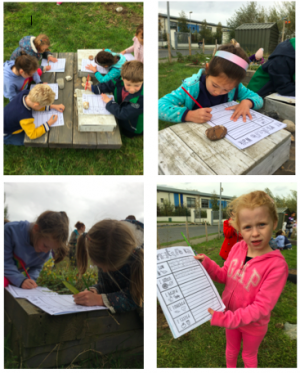 We decided it was safest not to taste anything in the garden, but we did find some plants that we thought were edible. We are currently reading George’s Marvellous Medicine in class and were inspired by George’s toxic concoction. We decided to create our own versions of the Marvellous Medicine. 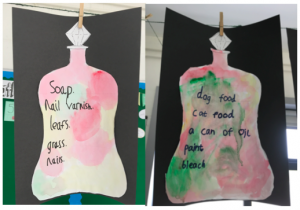 To recreate Roald Dahl’s phrase “.. and as he stirred and stirred, many wondrous colours rose up from the depths and blended together, blues, greens, yellows and browns.” we used watered down paint and wet paint brushes to blend the colours together. 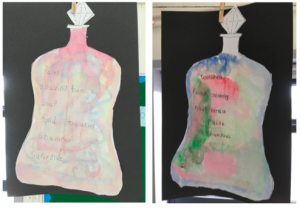 We then wrote first drafts of our potions in our English copies and then re-wrote our medicine ingredients on our potion bottles. I would like to begin by welcoming all of the children back to First class. I hope everyone enjoyed their first week back in school!! Last week we learned the poem, “The Crayon Box That Talked”. 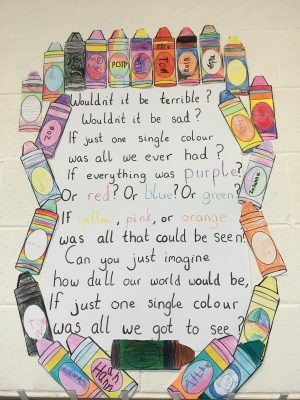 We discussed that there was a secret meaning behind the poem and how in Keith’s Class, we use every colour in our crayon box. We then made a beautiful display for outside our classroom so that we don’t forget the message of the poem. Please be sure to ask your child what the secret meaning of the poem is, and what the crayons represent to us.